Can the art therapy exercises for mental health help you? Mental health is as important as physical health, if not, more important. It’s easier to diagnose and treat a body illness than it is to find mental problems. 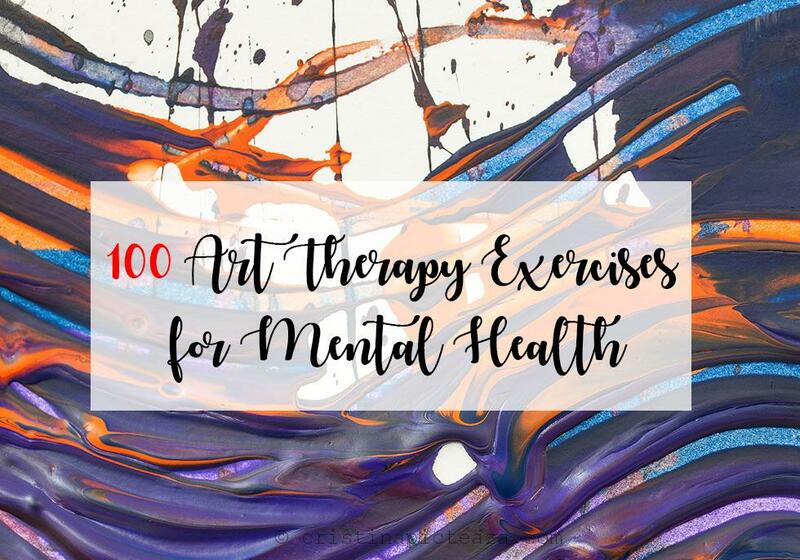 The following list of 100 art therapy exercises for mental health includes some of the activities I did to escape anxiety, depression or stress. These exercises help you boost your self-esteem and creativity, among other great benefits. These activities don’t have to be perfect or Picasso masterpieces, but your own expression. Just start working on these art therapy exercises for mental health and let your mind go with the flow. Draw yourself – you can use whatever art materials you want. Look in a mirror and draw yourself the way you feel. You will be focused on your appearance and step outside your mind for a bit. Sketch and color your emotions – this art therapy exercise allows you to let it go. Many people use red to express their anxiety, anger or fear, while others draw curved objects to express the fact that they feel weak. It’s important to take the time to listen to what your emotions are and draw them on paper. Abstract meditative painting – this type of painting allows you to focus on the painting, move the center of your thoughts from inside your brain onto the canvas. It could be a beautiful sunset, a stormy sea, a colorful or black and white abstract painting. Figure drawing and coloring – you need to draw a human figure and imagine it’s your body. Using colors and words, fill the shape to express your emotional state. In the article Art therapy for Anxiety, I attached some exercises you can do. So, you can download from there, the human figure and copy it or print it to start this exercise. Coloring books for adults – one of the latest trends in art therapy is the coloring book for adults. In essence, these books contain lots of line-art drawings you can color at your own pace. I tried one of those myself and they are great. If you like them, check below my coloring sessions on one of these relaxing books. Draw and color your heart – this exercise must reflect your deepest emotions. Draw a big heart shape on a piece of paper. Next, draw in all the emotions you feel. If possible, focus on all the emotions you felt in the last 7 days. This should help you notice with what emotions is your heart busy, most of the time. Color a mind journal – create a journal for a month. Draw a circle that represents your mind and draw in how you feel every day. This means you must at the end of each day to draw and color how you felt. Associate each emotion with the event that made you feel that way. Notice the days when you felt better and try focusing more on those events. Scribble mindless – a good way to destress is to grab a pencil or coloring pencils and a piece of paper and scribble shapes as you please. Don’t think about anything and simply go with the flow. This activity is similar to meditation, but you must be aware when your mind starts thinking about quotidian problems and gently change the direction. Mandala art therapy – another gorgeous example from the art therapy exercises for mental health is to draw and color a mandala. You can get inspiration from various models you find on the internet. Draw with white charcoal on black paper – this exercise is very useful because it makes you focus on adding more light into the darkness. Because you start from a black paper and you gradually draw in with the white charcoal or a white pencil, you get a sense of enlightenment. Create a finger painting – this technique allows you to get intimate with the drawing because there is no brush between you and the paper. The act of touching the paint and applying it on paper has the same therapeutic effect like working in the garden, bare hands. Paint on a large canvas – Allowing yourself to paint or draw on a large canvas helps you overcome many mind limitations and self-insecurities. We tend to build limits in our minds and this art therapy exercise helps you to overcome them. Create an artwork with your eyes closed – drawing a painting while being blindfolded helps you disconnect and sharpen your other senses: touching, hearing, and smell. You will create something unique and live a new experience. It’s both relaxing and entertaining. Draw and color your family on paper – a great therapeutic activity for adults is to focus on the family and draw them. This helps you remember what is important in life and you will feel love and gratitude for having a family. This is one of the most beautiful art therapy exercises for mental health. Paint famous paintings in your own vision – try recreating the masterpieces using your own style and colors. Draw yourself as a superhero – this exercise can boost your self-esteem and feel better. Also, you can focus on all your qualities and make the most relevant your super-power. Draw with a friend – this is a great exercise from which both you and your relationships can benefit. Sit face to face and try drawing each other’s portrait. This art therapy exercise for mental health will be amusing and enjoyable. Set your spirit animal free – think about what animal would best represent you and try drawing it on a piece of paper. Design gratitude cards – draw and design gratitude cards for your family and friends. You will feel great because you do something for someone else. Paint your dreams – keep a journal next to your bed and each morning write down your dreams. Later, create artworks based on your dreams. Some of the dreams can be very inspiring. Paint motivational words on a t-shirt – this exercise will boost your motivation and self-esteem, plus you feel proud to wear something you created. Paint on clothes – this is also an activity that will make you feel better, but you can paint whatever you want: abstracts, words or shapes. It’s up to you. Create ink drawings – this is one my favorites art therapy exercises for mental health. I love to draw ships in ink, but also flowers. You can get inspiration from the following playlist I created. Draw your favorite childhood cartoon character – Sailor Moon was my childhood heroine. I used to dream to be her. This exercise helps you connect with warm feelings from childhood and feel better. Watch one of Bob Ross’ painting tutorials – his videos are said to be very relaxing and enjoyable. He speaks softly and the overall experience is soothing. Paint on the walls – you can use a projector to sketch the line-art and then color it with acrylics. Learn to use oil paint – oil painting is very interesting and using a palette knife to apply the color on canvas feels good. Paint your phone case – this could be an interesting project. Also, you get to personalize your phone with something unique. Check my video tutorial here to get some inspiration. Paint on various objects – If you take a walk in the park or along the beach you can find rocks, sea shells, leaves and other beautiful objects. You can then paint or color them. Draw the good in your life – draw all the positive things you have in your life. Draw portraits – sketch or draw the portraits of your friends and family. They will be more than happy to receive something made by you. Paint something with one color – Pick your favorite color and paint something you love. Draw something that feels like freedom – here is a drawing I did. Paint a mountain – draw a mountain and yourself climbing it. Think about all the great things that await you when you reach the top of the mountain. Paint a valley – draw a valley and think about those events that made you feel bad and what they thought you. Notice how strong you become by facing them. Color stars on a sky – paint a black sky and use white and yellow to paint the stars. With each star you paint, think about all the blessings you have in your life. Draw with dots – create a piece of art using only dots. It’s relaxing and distracting. Paint by numbers – there are many online websites that sell kits for painting by number. It’s something similar to the coloring book for adults. Comics – think of a funny event in your life and try creating a comics strip to explain it. Childhood – draw yourself as a child. Think of all the things you would tell yourself if you could go back in time. Write them down on paper. The Angry face – draw an angry face on a piece of paper. Next, write all the things that would make the angry face calm down and relax. The Sad face – now draw a sad face and write all the things that would make it happy. Goal drawing – draw your biggest goal on a piece of paper. Think of all the methods and steps that could help you achieve the goal. Map of the heart – draw the map of your heart. Think of all the persons, things and hobbies that occupy a place in your heart. Ambidextrous drawing – try creating a drawing using both hands at the same time. This will use your both brain hemispheres and help you focus on stay grounded. Hands shape – place your left hand on the paper and sketch its shape. Repeat with the left hand. Now, in the left-hand shape write all the things that happened to you in the past, and in the right-hand things, you wish to happen in the future. Listen to meditation or relaxation music – this is one of my favorites art therapy exercises. Whenever you feel stressed or angsty, listen to relaxation music, piano music, rain and nature sounds. Accompany this activity with painting and you will get a great effect. Go to a symphony concert – while a pop or a rock concert will make you feel energized or hyper, a classic concert will make you feel more self-conscient and find your center. Learn to play an instrument – focusing on learning how to play the guitar can make your mind shift from overthinking to studying. Plus, it will improve many cognitive skills. Listen to the music of nature – a walk on the beach can help you de-stress and overcome anxiety. Go karaoke – you don’t have to actually go to karaoke, because you can play a karaoke video on youtube and start singing. Chose songs that express your current emotions and start that singing session. Sing carols when it’s Christmas – this can be relaxing and joyful. Draw using music – Listen to your favorite songs and draw what they make you feel. Dance – simply play your favorite music and start dancing. Write lyrics to popular songs – pick a song you like and write your own version of lyrics. Guess the song – work on this exercise with your friends. Pick a song and don’t tell anyone its name. Mumble the song so your friends can guess what song you were thinking about. Song list – take the time to search and create a playlist of your all-time favorite happy songs. Emotions and music – play this with your friends. Write on a few pieces of paper all sort of feelings, fold them and put them in a bowl or a hat. Pick a piece of paper. Think of all the songs that represent the category written on that paper. Brainwave music – listen to music that has the same wave as your brain. On the internet, there are plenty of such songs. Listen to no-lyrics songs and come up with your own lyrics. Other art therapy exercises for mental health involve sculpting, acting, dancing, but mostly, creating something new, validating and accepting your emotions and moving on. Create a collage journal – this is one of my favorite therapeutic activities for adults. Basically, I search in my old magazines’ images that make me feel good and glue them on a notebook. I try to build a future image of my goals and how I want my life to be. I heard this technique is efficient so I tried it too. And yes, it worked. Many of those things I glued in the journal came true. You can create a collage of all the places you want to visit in your life. Photography therapy – a great way to relax is to go for a walk in the park or in nature and shoot a few photos. Focusing on finding a lovely thing to capture is relaxing and entertaining. Family album – looking in the photo album of your family can act as a therapy session. You can also print your family’s members’ photos and make a lovely collage. Perhaps draw a mountain landscape and glue the images on that drawing. Write poems – writing poems could help you express your feelings in a new way and make you feel relieved. Write novels – you can also start writing novels where the main character is you. Create a personal blog – in a blog, you can write your most important life events or about the things you like. You will have a sense of belonging when other people will read it and relate to your experiences. Make a blot art – for this, you will need ink and paper. Similar to a Rorschach test, you can place a few drops of ink on a paper and fold it in half. Then, try to describe what you see. Practice yoga – yoga is a great way to relieve stress and pain. Create a dream-catcher – if you have trouble sleeping at night or you can’t sleep, try creating a dream-catcher. Sculpt something – use clay or polymer clay to create something unique. Try DIY tutorials – create various designs and objects following DIY tutorials from Youtube and Pinterest. Create something out of recycled objects – this will bring a lot of satisfaction because you will also save money and create something new. Shake it off – Enroll in a dancing course and learn to dance. This activity will make you feel better, but also make you look better. Try mixed media – create an artwork including collages, crayons, markers, paints and more. It’s relaxing and pleasant. Think about a great invention – Just imagine yourself inventing something great and how you would use it to save the world. It’s a great imagination exercise. Motivational board – put together your favorite motivational quotes on a board and place it where you can see it every day. Sand art – when it’s summer, build a sand castle and enjoy childhood again. Sand writing – write in sand thoughts you would like to forget and watch the waves erase them from the sand. Play with legos – build something big using Lego pieces. Write about a spiritual experience – think about a spiritual dream, encounter or experience and draw it. Redecorate your room – brighten up your days by redecorating your house. Create bracelets – use beads to create bracelets that you can offer to your friends. Letter to you – write a letter with everything that you like about yourself and put it away. Read it everytime you feel depressed or sad. Practice ikebana – this exercise is similar to gardening. Basically, you arrange flower vases in a simple, yet aesthetic way. Therapy through theatre – enroll in an acting class and learn to control and express your emotions. Also, a great exercise is to pretend you’re someone else and to understand what they would think. Acting will also involve lots of art therapy exercises for mental health. Write a resolutions list – in a journal write a list with all the things you want to accomplish next half of year or next year. Checking them once the time has passed offers a great feeling of accomplishment and you feel energized to write and check more items in your list. Pumpkin carving – if you’re around Halloween, try some pumping carving. These are the ideas that I come up with. They are mindful art therapy exercises for mental health. Also, I reimagined some of the traditional games for the purpose of mental relaxation. I hope you find in this list of activities that will work for you.